Oversized directory makes this panel perfect for better commercial and apartment buildings! 24-40 18-3/4" 12-1/2" 16-1/8" 10-5/8"
44-60 18-3/4" 19" 16-1/8" 17-1/8"
64-80 18-3/4" 23" 16-1/8" 21-1/8"
84-120 18-3/4" 29-1/2" 16-1/8" 29-5/8"
124-136 18-3/4" 38" 16-1/8" 34-1/8"
140-160 18-3/4" 40" 16-1/8" 38-1/8"
164-200 18-3/4" 46-1/2" 16-1/8" 44-5/8"
Regency™ Lobby Panel: Intercom panel shall be a Lee Dan vandal resistant Regency™ series or approved equal. Panel shall be constructed of heavy extruded aluminum with permanently engraved solid aluminum black anodized plungers. Pushbuttons shall be self-wiping type with positive screw terminals. Pigtail connections will not be acceptable. Pushbuttons shall be mounted on a sub-plate mounted behind the extruded aluminum module(s). Pushbuttons shall be activated by pressing the solid metal plungers. Speaker shall be 3.5", 1 Watt, 45 Ohm with mylar cone. Paper cone speakers are not acceptable. Speaker shall be protected by a double metal speaker baffle. 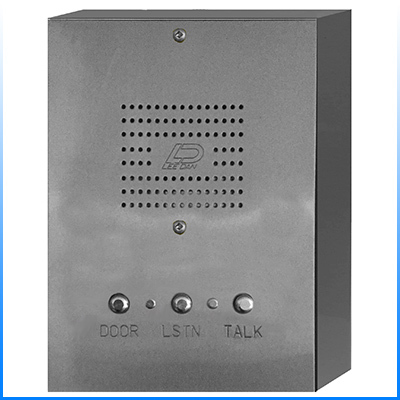 Intercom panel shall include an oversized 6.5" wide integral alphabetical directory protected by Lexan® sheet. Narrower directory modules shall not be acceptable. 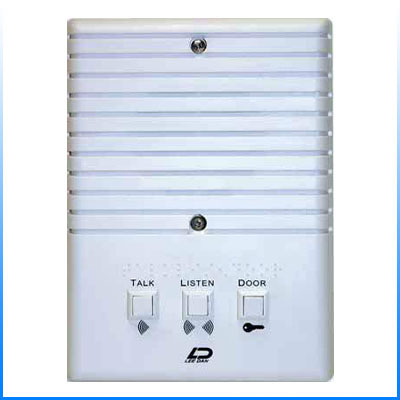 Speaker, pushbuttons and directory components shall all be field replaceable. Glued in place components are not acceptable. Mounting screws shall be tamper resistant Scrulox type. 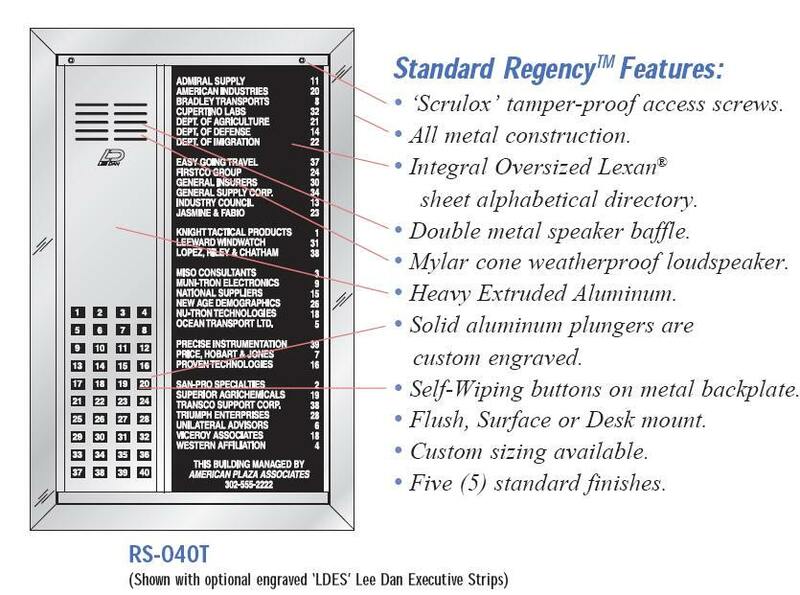 A Lee Dan model SC-1 Scrulox type screw driver shall be provided with each lobby panel for directory maintenance.